Great waves, good weather and all kinds of beaches make Gran Canaria the ideal resort for surfers. Gran Canaria has top quality waves all year around, especially during Autumn (for a dream surf trip) and Winter because it receives the powerful North Atlantic ground swells during those months. Research by Siracusa University (EEUU) describes Las Palmas de Gran Canaria as the city with the best weather in the world and the island displays both sub tropical and arid landscapes that typify the island chain. 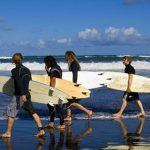 Gran Canaria’s most popular surfing area is Las Canteras with a variety of beach and reef breaks, from El Confital to El Lloret. Countless spots can be seen along the north shore but many of them are dangerous and have difficult access like the slab reefs around Galdar. 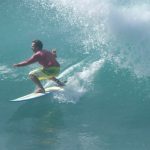 This coast is a swell magnet and can pick up small summer swells at beaches like Los Enanos, El Roque and Vagabundos. The west coast is a wall of sea cliffs so surf spots are almost non-existent. Tauro, Arguineguin and Maspalomas are the best spots in the south, working on large W swells, but this area is nowhere near as consistent as the north. The east coast breaks receive swell all year round and offers many good quality spots, including La Izquierda del Muelle, which works in the dominant NE winds. Autumn and winter is the best season for travelling to Gran Canaria but there can be waves on any of the coasts at any time of year. For beginners there are surf schools where you can learn safety. (Be sure to learn the basic rules and surf etiquette before you go). Also, check out the different types of surfing waves. Surf Lessons, Bodyboard and StandUp Paddle, Surf camps, Surf equipment rental, surfaris, photographers and discounts for university students, groups and enterprises. 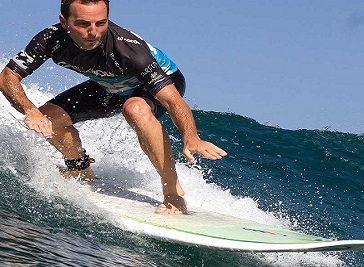 earn to surf with us in perfect weather, perfect waves and with highly experienced, fun and qualified instructors! The Surf School is based at the foot of the sand dunes of Maspalomas in Playa del Inglis.